Mike Leggett interviewed each of us for the Bundanon Trust, in the lead up to the Sensorium Gymnasium event at Peformance Space, in July-August 2009. 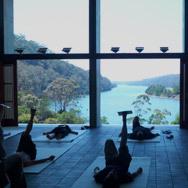 In the following transcripts we discuss what Thinking Through The Body means for us individually, the impact of the Bundanon Residency, and the project more generally – on our different practices. Mike Leggett: Okay, so what is thinking through the body about for you? Maggie Slattery: Okay. I was invited into the project because of my background in human movement. The work I do, which is Feldenkrais work, is in essence a study of the learning that’s involved in human movement. I therefore would interpret thinking through the body from the basis of learning, which requires paying attention. Human movement is based on patterns that develop over time, through developmental stages, that need to become automatic so that life can be lived and we can do lots of things at once. In order to know something about the body, in order to know something about my movement, I actually need to come to a different place outside of that automaticity in order to know what’s going on. Or if I need to improve movement, for example, same thing – I need to bring to the foreground aspects of what’s going on in my body in terms of felt sense pay attention, then, of course, everything has to go back to being automatic again. So when the question of this project was presented, this question of thinking through the body, thinking for me includes awareness of sensation. So it’s not just about being in the head and being cognitive, but having a sensorial relationship to that. When I came to Campbelltown for the first gathering – just to back up a little bit, I was invited into the project by Catherine Truman, who is a maker, and I would have not described myself as a maker, nor would I have ever put my hand up to be part of a project in which everybody is a maker, but she dragged me along. I was a bit wobbly to start with, trying to feel how on earth could I be contributing here? When I came to the first session I was trying to understand what thinking through the body meant to everybody else – that’s taken a long time to understand. But, in particular, I wanted to know from George and Lizzie’s point of view, since they had made this all possible, what were their driving questions. One of the things I picked up on was that, differently than my generation, the generations younger than me have all grown up with technology where the word interface is about a relational point between technology and self. The emergence of interactive art began to make sense to me as somebody outside of a generation which has grown up with technology. I’ve never played Gameboy; my thumbs are stupid compared to generations younger than me. My relationship to the screen is very basic – it’s about emails and writing documents, nothing else. So it seemed to me that the question was about the fact that this technology is a huge part of people’s lives – not mine, but just about everybody else. Whereas I spend a lot of my time, because of my work, working with the body, most people spend a lot of time working with technology. So it makes sense to me that technology comes into art – it’s part of life – but it seems as if it’s a very new integration into art practice. The question maybe is, when a person visiting a gallery comes to experience interactive art where as they in relationship to their body, given that technology can have an influence on our lives which is very, you might say, disembodying. So what happens there? What about the maker – where was their experience of body as they were making, and can interactive art include the body? So that’s how I understand the project of thinking through the body. Therefore, Bundanon or Riversdale became the central influence, I would say, toward what’s possible here this week. So we started off in Campbelltown and we were together trying to understand what the questions are, introducing these strange works like Feldenkrais and other modalities that have to do with body, introducing people’s work from their practice. I’ll never forget the first time we had a meeting and everybody but me sat with a laptop on their lap with the screen facing out and I felt naked because I didn’t have a belly that was a screen where I could play my work. Mike Leggett: So how did you respond? Maggie Slattery: How did I explain my work? Mike Leggett: How did you respond in that kind of rather confronting presentation from the others? Maggie Slattery: I was silently in agony. I was absolutely sweating. I just though, what am I doing here, why am I here? Mike Leggett: So how did you resolve it? Maggie Slattery: Well, I can’t say I resolved it because I’m quite familiar with not knowing what to do in a situation. I mean, part of my practice in Feldenkrais is to be in front of not knowing what to do. Because I’m working with another person and I can’t make assumptions about that person, I have to be able to be comfortable in that place of unfamiliar and not knowing what to do. Nonetheless, I am a human being and I am an emotional being and I was sweating it, feeling really a bit silly. Everybody had Apple laptops as well – it wasn’t just about a laptop – except one person had a Dell laptop and I thought he looked a bit goofy, you know, because he didn’t have an Apple, so I didn’t feel quite so bad. I think I just said, I can’t show you my work, my work is in the moment, something like that. Mike Leggett: You didn’t just tell them to put their laptops away, stand up and I’ll show you what my work is? Maggie Slattery: Hardly. No, no. But Catherine Truman and I were sharing a little flat and when we went down stairs she had to sit with me and make me a cup of tea and we had to talk through this, because I wanted to go home. I just thought, what am I doing here? Anyway, Bundanon; it became very clear what I was part of the group because Bundanon gave us time. Work with body, work with awareness and attention to self takes a lot of time and it just was absolutely enhanced and supported by that experience; also developing relationships – not just a relationship with myself as being in a body but with each other. Not only that, but a relationship with each other through technology as well. That was just so exciting for me because I was able to become part of each person’s work with technology and to find in it that it was a self expression, not about the technology driving the moment; it was a very human experience. Mike Leggett: So that was one of the main outcomes for you, which is continuing to be an outcome for you, that bringing together of those two different sides of practice, if you like – your own and theirs, which is much more around technology? Maggie Slattery: Yeah, it’s about learning, has been about learning for me. Paying attention to the body is about learning. I have to learn about what things feel like – things meaning, say for example in a movement. Obviously a movement is a complex thing and there’s a lot going on. I can only feel what’s going on to a certain level until I have more capacity to feel the difference between two things that are very similar, and being able to make distinctions grows my experience of movement. So for somebody who isn’t in the study of movement everyday it takes time to learn to even enter into that study. Similarly, I found out that with technology once I had more language and more capacity to pay attention – and I also had more meaning because it was about the relationship with the maker – I’m now able to stand alongside Garth and look at dots moving around on a screen and become emotional. Because this is expressing what’s coming through him because of his aim, but also where I am in those dots; they come from something that Garth and I and Catherine, in this instance, had the idea together – it emerged through the three of us. So I’m learning to be in time with attention to technology. Mike Leggett: what is thinking through the body about for you? Catherine Truman: It’s really fascinating because I’m both an artist and a Feldenkrais practitioner. The question on every artist’s lips, really, is what we’re trying to say in our work and who’s it for. With this particular project, I’ve been invited as both an artist and a Feldenkrais practitioner to respond to that topic, thinking through the body. It’s almost an anomaly. In fact, at the end of the other night I could hear myself quite clearly saying maybe it’s not possible to think through the body and there was dead silence around the table. And maybe it’s not. The reason why I say that is because my experience of being able to articulate what sensation is, it almost cancels – one cancels the other out. In my [making] experience, I’ve found that it’s very difficult to articulate what being absorbed feels like, what the sensations are, what happens to your sense of time, what happens to your body in the process when you’re completely absorbed in the process of making something to the point where the tools in your hands and the materials you’re working actually are your body, are parts of your body. So it’s been fascinating talking to people here who use a lot of technology in their work and how they embody it or how they’re dislocated from it. People’s experience of that dislocation is quite common with a lot of technology. So my aim, really, is to strip that right back to a question of is it possible to be in your sensation and how familiar is that. Mike Leggett: Do you think the residencies have helped in…? Catherine Truman: A great deal. It’s helped my understanding. First of all just to try and understand the question, is it possible to think through the body and why you want to do that. And for me, it’s like going back to a rich resource material, the body. That’s all we have really. That’s all we should really – that’s what we know about. Also, I have to say, we don’t know an awful lot about the body, both literally – because I’m also doing a residency at the moment in the anatomy and histology department at Flinders University in Adelaide, so working with neuroscientists and histologists and listening to their approach of the body as opposed to my body, trying to marry the two. That’s what I’ve been trying to do in this workshop, this project. What is the difference between the body and my body, other people’s representations of the body and my idea of my own body? What informs that? Is my perception formed by lots of other people’s perceptions of other bodies? So in trying to develop projects which are, in essence, interactive artworks in process, the question comes up as to if you were thrown into an unfamiliar environment, such as an interactive artwork [unclear], can you sit with that unknowing, can you sit with that fear, that unfamiliarity and still be in your sensation, still learn something about your body or do you just learn something about discomfort and is that very difficult to articulate at the time and therefore how does the artist understand their work through somebody else. So intention’s really important. What is the artist intending? Can we remain open to now knowing perhaps? Can we respond through our senses that we know about rather than a lot of analysis? Are we able to do that? Mike Leggett: When you were at Riversdale, you led some practical workshops very much to do with that. Could you say something about that? Catherine Truman: Yeah, that was a lot of fun for me. It was an amazing opportunity to work with people who are already very, very open to that kind of way of working and that not knowing where they were going to be headed with it and to ask people who are very much mind-centred to go into sensation, for quite some time really. Mike Leggett: Could you describe some of those approaches? Catherine Truman: Very simple approaches. It’s really what I’ve been talking about. To ask somebody if they know themselves well enough to be able to draw an outline of themselves on a piece of paper and to watch that process occurring was fascinating for me. I know it can be a very confronting process, but when you’re willing to go there, it’s less confronting and more kind of educational in a way. I watch people measuring themselves, literally and metaphorically, against themselves and each other. We did a lot of Feldenkrais lessons. So that was a point of comparison too. I think I started the first instruction was can you draw the body, or a body. Can you draw a skeleton and they did and they got little pieces of paper and they drew very tight little bodies and bones inside from – I could see them pondering and I could see them feeling themselves to see how many bones were there. Then I gave them a Feldenkrais lesson where it was bringing their attention to the sensation of the structure of themselves through the skeleton. Very simple movements where they felt [efforting] and no effort, where they were balancing through their bones and through their muscles. And then asked them to redraw their bodies. The language was very clear, draw your body, and now an outline of your body and then fill that outline with your skeleton. It was scaled 1:1. I gave them chairs and I asked them to occasionally stop what they were doing and stand on top of the chair and look down on themselves to see if that changed their response to the drawing. Mike Leggett: People have referred to the ‘Distinct Body’ clay workshop you presented at Bundanon. Catherine Truman: Yes, again, that was an interesting exercise of comparison too. Also some people haven’t used much clay before so, sighted, I ask them to make a body again. They had to negotiate the material, the feel of the material and what the material would and wouldn’t do in their hands and negotiate a shape that was meant to be a body. The next exercise, after another awareness through movement lesson, the Feldenkrais lesson that puts you straight into your own body, I blindfolded them and asked them to make their own body in clay. So they had to go straight into – most of them used both hands then and most of them were incorporating their body in whole movements to manipulate the clay. They’d become much larger movements, much larger figures they were making and also they were imagining how they see themselves in a particular position or movement that, in essence, came through into the final work. It was a real privilege watching that. Normally I put a blindfold on too and I do the exercise too and the room normally is in lockdown, they don’t let anybody in or out. So it’s a safe situation. Mike Leggett: So it sounds like the outcomes for you from this collaboration, this project of work, arrived very quickly as it were, whereas other people are, from what they’ve said, are still searching. Mike Leggett: Finding it, yep. Catherine Truman: I guess I’m finding each person in this workshop through my philosophy, I guess. I’m trying to find them and I’m trying to say what is it you’re asking in your work or what is it that interests you. I think it’s really that simple. I keep on asking questions to pare back as much as I can to get back to the body, to the starting point and to really come from that point, rather than what’s out here, what does this technology do, well I could do that with it or that with it because that’s the parameters of the technology, not what’s my question, where’s it coming from, how do I find a way to say it. Or what am I eliciting from the person who’s interacting with actually me through the work. I’m just trying to get people to – and it’s a question I ask myself. I admit that fully. It’s my learning, my questions, things I need to learn. Why is it so important that I need to ask this of somebody else. Mike Leggett: If you could start by saying what it is you think thinking through the body is about for you. Garth Paine: Thinking through the body is about focussing on subtle effect for me and often when we’re looking at interactive arts, we’re looking at really gross, essentially really gross level engagement, pushing, whatever. You know, large movements. So thinking through the body has, for me, been about internalising, coming down to smaller, smaller, subtler, subtler movement and then getting a sense of that sort of total body experience and how that’s reflected. That’s what it’s been about for me. Mike Leggett: How have the residencies facilitated this, again for you? Oh, you haven’t been [unclear]. Garth Paine: Thinking I wasn’t at Bundanon ‘cause I had to have a large cut and bits of me taken out. So I was thinking through the body, intensely, during that series. The surgeon said we had to make the cut big enough to put my hand in. I said thanks for that information. Anyway, what have the residencies? The residencies have provided an opportunity just to be in one space for a period of time and intentionally to discard all other demands and activities and so on. Then because of the focus of the project being this notion of thinking through the body and the fact that we have some Feldenkrais practitioners on the project, they’ve given me – I’ve felt like I’ve had time just to focus on the body or on a perception of the body anyway, and to unpick, to some extent, what that the perception of body is and how we might reflect that. I’ve kept a bit of a focus framework being interactive art throughout this project, so for me it’s been a little bit about an opportunity to think about well how might we reflect these things and how might we get to subtle, really subtle levels of reflection through media arts in some way. Mike Leggett: So how has being in a residency aided this, made this possible? Garth Paine: Thinking Well, time, discussions, expertise of people whose area of work is body, is knowledge of the body, subtle knowledge of the body. And there’s been a sort of, I guess, the sense of as a group exploring that. So we’ve been doing yoga and Feldenkrais classes and physical activity things together which has caused a sort of sense of shared knowledge, of a sort of networked body if you like. Like in a sense, that the collaborative team has become a body as well. And then I guess, particularly here for me, the establishment of some technology and putting some motion capture system up and surround sound system and building some environments that are a little more intimate and enclosed and facilitate a degree of detachment from the outside world and a space to focus and have more intimate engagement, I guess. Mike Leggett: You missed the Riversdale residency. From what it is you understand through interaction with other people, what do you think it was you missed by not being able to attend that residency? Garth Paine: Thinking That’s really hard to say, actually. Mike Leggett: Because you didn’t do it? Garth Paine: Thinking Yeah, exactly. And it was an interesting experience trying to catch up. Like for a bit I thought oh, I really need to catch up, I really need to read the blog, I need to – I don’t know. I felt my purpose is to catch up and I read the blog and looked at stuff and I thought there’s lots of words here but actually I don’t – people are talking about quite deep personal experience and so you can understand that as a description of their experience, but you can’t actually understand it as shared experience, I don’t think. I couldn’t. So there was after a little bit, I went okay, so that’s – I’m not going to catch up with that, that’s an experience that I didn’t have and that’s fine so I’ll just put that aside and continue to bring what I can bring to the project. We did have another full day meeting where everybody came together at the VIPRE lab and that was, I guess, a little bit of a regathering for me. And because it was in my lab and I could play some sound that I wanted to play people in really high quality environment, I was able to introduce myself back into that dialogue, I guess. Mike Leggett: Because you did a residency at Riversdale previously with Nigel [Helia]. Garth Paine: Thinking That’s right. Nigel and so on, yeah. Yes, I’d been there, actually not that long beforehand. Garth Paine: Thinking I’d done my residency in advance. Mike Leggett: But not with this group. That’s interesting. Did you feel that working with another group as a kind of adjunct to the main focus group that you’re currently with, did that add a dimension that possibly the others didn’t gain? Garth Paine: Thinking Well I guess there were two things. One is that I know, having been there for that previous residency which was around sound art, so we were very much in the environment, listening to the environment. I made some surround sound recordings while I was there that I’ve played to the others and have become a bit of a focus in a way for some of the things we’ve been doing. Yeah, it probably was important for me to know the energy of being there because it is a sort of settled and it has a certain weight to it and so I guess I’m able to understand something of what might’ve happened in terms of that energy. And then because I’d made those recordings previously and they’re very high quality surround sound recordings, when we play them, everybody goes oh wow, it’s just like being there again, you know. And the fish jumping and all that sort of stuff is in those recordings, so I guess at that level there’s a shared, although not really discussed, but a shared level of experience about what it’s like to be there. Mike Leggett: Outcomes. What do you feel are the outcomes of the project in its various residencies, for you and also for a later stage where a public might be involved? Garth Paine: Thinking That’s a really hard question to answer. Mike Leggett: Yes, but do answer. Garth Paine: Thinking What can I say? There’s a bunch of experiments that we’ve run and looked at. I’ve been recording motion capture data of subtle Feldenkrais manipulation and that’s really interesting ’cause it does have incredibly fine nuance in it which is something I can take away and continue to work with and we can continue to share things that might come out of that. I’m sonifying that data at the moment. I might also generate some visualisations of the data. So there could be a sort of experiential space that becomes a real time sonification visualisation of motion capture data in the space. Also through that experiment we’re finding we could do that actually with very few markers, which gets around some of the practical problems of motion capture and so on. I’m not sure, Mike. I guess that the thing to say would be that there’s a bunch of connections of discussions that I feel confident will be ongoing and that there’s a sort of residue of those discussions that is highly likely to infiltrate my practice and I’m sure everybody else’s. So where that goes in the long term, I think, is unclear to me but rich with potential. George Khut: For me? It was developed as an opportunity to spend some time thinking about connections that I was very interested in between interactive art and somatic bodywork practice. Somatic bodywork practice as I know it is through the Feldenkrais Method. Other forms of somatic bodywork comparable might be the Alexander Technique, things like Body-Mind Centering from Bonnie Bainbridge Cohen and there are a few other methods. They’re essentially about a way of re-experiencing your organisation of yourself – organisation of your muscles and skeleton and the movement patterns that you’ve learnt through your life from infancy, when you learn to lift your head, through to standing, getting up in the morning, working at your computer. That’s a short answer there. We could elaborate on it a bit more. Mike Leggett: That’s absolutely fine. So how have the residencies facilitated – again, for you – this kind of research? George Khut: It was this opportunity to bring these two worlds together. Mike Leggett: Sorry could we just pause there. George Khut: Rather than doing one big long intensive, I wanted to see how the kind of interactions we were having could ripple through our various practices and we could kind of fold our experiences in and out over the course of a year. So we’ve had three residencies in all and it was really this chance to bring together these various different worlds that each participant kind of brings to our work together. So we’ve got the Feldenkrais work. We’ve got Lizzie’s work of audience experience and curating. Lian’s work – similar in some ways to what Lizzie does in terms of involving that world of human computer interaction and design research. Similarly is Garth’s work as well, which is a little bit more focussed on interactive art, interactive sound especially and his interest in gesture and gesture tracking through motion capture and various sensing technologies. Similarly with Jonathan – Jonathan had a collaboration with Catherine through the [ReSkin] project that Anna did a few years ago. I was interested to see how we could support that dialogue there as well. Somaya’s own work as well with gesture and motion capture and her interest in sound and is kind of situated listening. Is that answering the question at all? George Khut: Maggie was involved in a dialogue that Catherine was having with Jonathan as well and there’s an ongoing relationship between Maggie and Catherine about the Feldenkrais practice and the much bigger philosophical psychological questions at the heart of it that connect to our all interests in art practice as well. George Khut: We brought Jon into the Performance Space workshop to help us with our computer programming, and he brings his own creative expertise in terms of working with interaction design software like Max/MSP and sonification …to help support some of the exploration that would otherwise take a few days – a few days that we don’t have at this stage – to accelerate that along, To give us something to touch interaction-wise – so to speak. Mike Leggett: Okay, so how was the Riversdale experience in particular? George Khut: It was such an incredible environment to work in, just in terms of feeling – having a really supportive environment that we could feel really comfortable in and such a focussed environment – that Riversdale – the Boyd Education Centre space is just purpose built for group work. So that was really quite incredible. And to be doing various experiments and went through movement classes and discussions in that space with this view out onto the landscape. The whole thing was so grounding and I compare that to – we went on a guided listening tour yesterday afternoon through Redfern and Broadway and it was like, this is really traumatic, all I can hear is these horrible cars and it’s putting me in a really cranky mood and it made me really appreciate what a change in environment in a really kind of beautiful – what’s the word – picturesque environment like Riversdale Bundanon – how that can bring out a sense of openness and trust in people. It was a perfect environment for really cementing our relationships. Unfortunately Garth wasn’t able to be there because he was sick, but we benefited a lot from that space. Mike Leggett: But he was explaining how he [contributed] earlier. George Khut: Yeah, we were able to listen to these incredibly high quality surround sound recordings in a studio and you could just be there again, it was really quite magical. As a trigger for kind of the headspace we were in at the time. Mike Leggett: I’ve heard those recordings and they were truly extraordinary. They really do transport you. So how would you describe the outcomes – again, for you and also for a public? George Khut: The outcomes for me at this stage – because we’re only half way through our third residency – the outcomes from Bundanon were about establishing a shared language and working through what it is that we were doing and what it is that – well what it wasn’t as well. So we’re not making art from Feldenkrais or making Feldenkrais from art it was something else – an understanding. It was about trying to identify these shared approaches and shared sets of questions that these two areas had and how they could enrich each other. So that was one of the outcomes for us, as participants. Also having the opportunity to test some things, like we had a session where we brought in some different interactive systems that made sounds from movement or light or you would hear things in relation to a landscape and we were able to reflect on that in combination with the two workshops that Catherine did and then the workshop that Jonathan did, which was about being in the landscape and how that connects to an experience of embodiment. George Khut: Public – I think it’s going to – there’s a lot of unpacking we’ve got to do after this show. A lot of – I think there’s – a lot of big things are happening now at our performance space here in terms of fleshing some of these interests we’ve had out into some experiences, which has been our aim with this workshop that we can share with other people and share with each other. I see this as leading to – eventually – to the production of a new body of artworks for myself and I imagine for the other participants as well. Already Garth has made some excellent recordings of the Feldenkrais functional integration, which is the one on one work practitioners do with their clients and we’ve recorded that in a motion capture system and recorded extremely subtle changes in breathing and the body organisation around breathing and able to kind of [sonify] that and record that and just look at these tiny details of that, just these fine things that – I mean, that was like, oh right, the project’s working, you know. I’ve brought these two worlds together and we’re getting this new kind of chemistry coming out of that. So that was already a sense like, mmm, there’s a lot in here. But I think the outcome for us is about a new level of sensitivity that we bring to our own work through having really examined very closely the kind of fundamental assumptions we’re making about our bodies, about our audience’s bodies and the body of the work that we create. So I see this in terms of public outcomes – we may not see those outcomes for at least a few weeks – beyond the showing that we’ve had. But in terms of actual exhibitable public works, it’s going to take a while for that to spread out. Mike Leggett: Could you tell me what Thinking Through the Body has been about, is being about for you. Jonathan Duckworth: A big mystery yes, [laughs]. For me anyway it has been about becoming more aware of my own body which up until doing this workshop I realise I was fairly ignorant about really. I was unaware of and through the workshop I’ve found greater awareness of my body schema so to speak. In that sense it’s been a very gradual process through the different stages of the workshop and that’s been really fascinating. I’ve got a fair amount of that my current work deals with people who have fragmented self images of their body and that’s really interesting. This has taken a different approach that’s been quite enlightening in terms of how to put together that image of your body so to speak. Mike Leggett: Could you just say something a bit more about that fragmented images? Jonathan Duckworth: Yes. I currently work am working with patients who have suffered from traumatic brain injury and as a result of their brain injury their own self image of their body is actually quite fragmented which results in difficulty in moving and difficulty in coordinating a number of motor functions if you like. So this workshop has helped me realise that the sensing that’s required to become aware of your own body in much finer detail than the way that I’d been exploring previously. So it was very useful in that regard to be more aware of through my own thinking through my own body what is the body image and how do you feel and sense it? Mike Leggett: So in that other work you work with a team and which is the expertise you bring to that team? Jonathan Duckworth: In the other project I mentioned? It’s really the designing of the interaction that the patients use to, yes designing the interaction and the sort of movement skills that we’re trying to bring back to these patients. I think we’re getting off topic really. Mike Leggett: Just trying to understand exactly how you would be bringing to this particular project, I understand that. So interaction to enable physical body skills? Mike Leggett: How do you feel the residencies have contributed to the work that you’ve been doing through Thinking Through the Body? The residencies have meant different things to different people, what have they meant to you? Mike Leggett: I mean have they been useful? Can you see the research work having happened in a different kind of way? Mike Leggett: But has it, so it’s been useful? Mike Leggett: Has the residency been a particularly useful way of operating? Jonathan Duckworth: Yes I think the residency has been a very important mechanism to help sort of facilitate in a group setting almost how we might articulate that thinking through the body the sensations of that. I think to do that on your own just wouldn’t make sense really. Mike Leggett: And was the Riversdale experience a particular part of that? Jonathan Duckworth: Yes that was an almost critical part to the Thinking Through the Body workshops because it allowed us to just isolate ourselves from the background noise of the everyday and be in a very special place that enabled us to relax and focus on some of the questions that we had and the explanations that we wanted to do. That was actually very critical I think, pivotal for the workshop to be there. Mike Leggett: So you’ve mentioned some of the outcomes from the project in terms of your own work in your other field, how about this project in terms of its interface with the public. I mean there’s a public interface on Saturday, but can you see ways in which it goes further than that? Jonathan Duckworth: That’s another interesting question. We were just discussing this over lunch actually and we didn’t have an answer to that. Mike Leggett: So what did you explore? Jonathan Duckworth: [Laughs] This workshop really, the public interface on Saturday is really about opening up our sketch book if you like and just showing some ideas, concepts, sketches but in a very physical form in some cases and what these ideas are. I think it will take a lot of consideration to see how we might take this forward, or some of these works forward. I think the audience response in the initial showings will be quite critical to giving us feedback in terms of what their impressions are of the outcomes. I think by doing so that may encourage some of the outcomes of this workshop to continue on. So I think at this point we’re all feeling very vulnerable we’re not quite sure what’s going to happen on Saturday and really to see if it gives us enough indications to whether it’s something worth pursuing onward for future works. I’m not sure if I answered that at all. Mike Leggett: That’s fine. I think the sketch book image is fine, opening the sketch book to the public, I think that comes over and really that whole sense of whether something can be made public only becomes foreseeable at a showing of the current, you know, what you’re doing. I think it will be very exciting I’m sorry I can’t be there. I think it will be magical actually, I think there’ll be a real buzz in the air. Jonathan Duckworth: That’s great I’m glad to hear that. Mike Leggett: The first question is what is Thinking Through the Body about for you? Lian Loke: That’s a big question. Thinking Through the Body for me is really expanding the idea of what thinking is. Ideas around cognition and really just bringing our full embodiment into our process. Because often so much of it, like the way we utilise our bodies in our daily activities and in my working life – which ends up being so much through a computer – it tends to be a very impoverished sort of bodily existence. And the nuances of knowing things and the pleasures of the body that I want to bring more into my daily life or practice or whatever it is. Mike Leggett: That’s good. So how have doing these residencies made all of that possible for you? In what way has that enabled that? Lian Loke: It’s interesting, isn’t it? Because there’s always a sort of yearning I have to be in that kind of mode of existence. Yet it’s so easy not to be, to just to remain stuck in all those sort of daily habits and ways of working. So it’s been really refreshing to have – well the first two residencies in particular, where it was very body-focused. Working with the Feldenkrais Method and doing that every day. Just getting back into a really strong sense of what my body is, where I am with it on a daily basis, how to articulate in different ways, how to give it attention as well. Just increasing that sense of being comfortable in working from there. It’s interesting though, with this residency we haven’t had the daily practice and so it’s quite a different sort of experience. Even though we’re now trying to create various works or experiments from the body, and drawing all those things together. Mike Leggett: Was the Riversdale experience particular in any way? Lian Loke: Riversdale, yes. It’s been full of surprises because coming together in a group of eight of us, most of us didn’t know each other to start with. Or there might have been two or three people that I have had some dealings with but not really strong personal or intimate connections with. Riversdale was really about just – I don’t know, we really kind of came together and felt that we were working from the same place. A lot of trust was established there, and so it’s been really quite pleasurable and surprising and lovely that we’ve developed that. As well as just about doing interdisciplinary work and trying to make things together, there’s the personal connection and the ability to be able to communicate across all different disciplines, but on a very sort of just sharing intimate level. It’s been really lovely. And to have that background now, to be able to do all the things from. I feel like in the future – we’ve actually established really strong relationships with people from which future things will result. Riversdale the place itself was quite extraordinary in just slipping into a more – time slowed down I think. It was like letting go of all expectations, any pressures to produce things, and just coming back into almost like that deep pleasure you find in your body sometimes. Through a combination of doing Feldenkrais every day, and very interesting work we do with Katherine, with being blindfolded and sculpting with clay from our felt experience of our bodies. All these little shifts in actually thinking about ourselves and where we’re working from and where our body sort of fits in that, they were really really interesting. It was great to just be in that state and say that’s okay. Mike Leggett: The uninterrupted nature of it – I can imagine it is different from say the residency you’re doing here, or the one you did at Campbelltown where you really returned to your homes. Lian Loke: Campbelltown, we did have accommodation out there. But for this one no – well I’m certainly going back home every night and checking my email and those kind of things. Mike Leggett: So do you think that makes a difference? Lian Loke: It certainly helps being completely locked away somewhere in beautiful surroundings, but [unclear] to come back here. This is very much a working place and there’s a lot of support here too, technical support and that sort of stuff, to actually start making things. Mike Leggett: Final question, how would you describe the outcomes for yourself and for the public? Lian Loke: Outcomes from this residency? Well for me, first of all having just completed my PhD and working – and a lot of that work was about trying to bring together understandings of the body from dance. Then this design way of working with motion-sensing technologies. And trying to map relationships between those and languages, vocabulary you could use as a designer to negotiate all those different perspectives. But even within that I wasn’t really making stuff, so it was amazing to then have this project to step into and go well great. Because one aspect of my thesis was very much about felt experience and this has just been going there completely. Then also having all the sort of sensing technologies here as well. On a sort of personal, practical level it’s about ‘okay how can I start to actually really work with those things more deeply, and start to bring them together?’. I also wanted to start playing with some of the Wii motion sensing gadgetry, [Maximus P] and programs like that that a lot of people here have expertise in. For me it’s about skilling up in that way as well so I can actually come from a more established foundation myself if I’m designing things. Then also to work with the Feldenkrais practitioners: that’s opening up a whole other kind of realm as well. So there are all these openings going on, which is great. So that’s really positive. But for the public, I think that’s much more challenging. This open day it’s going to be very interesting to see how people receive what we’ve been doing and to find out what they think about it. Because even what I’ve been working on just at the moment – the concepts I had are getting really broken down through putting the body back in to the scenario, and everyone’s different bodies. Things are just getting thrown aside, remade. Yes, I thought I had it all worked out and now I’ve gone into that space again. I’m just going where to now? Do I just throw it all away and start again? Or how can we shape it into something that’s going to be interesting, meaningful? Mike Leggett: But you can see that some part of this experience is going to be presented through your own work to a public? Lian Loke: Outside this project? Lian Loke: Yes. I would certainly hope to, yes. This feels very much like preparation for things as well. There’s lots of trying things out, experiments. Maybe in like a year or two I’ll have something to present, yes. Mike Leggett: What is Thinking Through The Body about? Lizzie Muller: Thinking Through The Body is a research project and it’s an interdisciplinary project which is an experiment both in ways that practitioners can exchange information about their practices and teach one another. It’s a kind of – I wouldn’t say pedagogical – but it’s an experiment in exchanging knowledge and also an experiment in making. Mike Leggett: How have the residencies facilitated this for you? Lizzie Muller: The way we set up Thinking Through The Body was as a series of short, intense workshops rather than one long intense workshop. The three residencies went over the course of a year. The reason we did that was we wanted the things that we’d learned in these residencies and these intense periods of exchange to become part of each of our individual practices. So we didn’t just want to come, go very deeply into this process and then go away and carry on with our individual lives. We wanted to develop something a little bit deeper that and have a conversation over a longer period of time. So we had three individual residencies over the course of a year and they all had very, very different flavours, very different atmospheres which was really interesting. I don’t think we’d really factored in quite how different those three residencies would be, partly because of the different places they were in and partly because of those shifts you get in terms of interpersonal relationships and as we slowly came to know each other more. Also the period we were at in the project, so in the middle we were very experimental, towards the end now behind [significant] performance-based – we’re making very intensely in that there’s a lot more pressure and a lot more – I wouldn’t say there was necessarily less openness – but we’re definitely less playful, more serious now. Mike Leggett: Was the Riversdale experience particular for you? Lizzie Muller: Riversdale was very difficult to explain. The best way I can think of describing what happened to us at Riversdale is that we were all abducted by aliens, which sounds extreme, but I was trying to find a metaphor for what an intense experience we’d had and how difficult it was to convey it to other people. There’s lots of reasons why Riversdale was such an intense experience. One, it was incredibly hot and that extreme of temperature put us into a very interesting state of mind. Two, the place itself was almost like a collaborator in the project, so the openness of the space and the way we were able to work there as a group and also have quite a lot of individual time. I think above all, probably our disconnection to the rest of the world. So in this residency and also the first residency we did at Campbelltown Art Centre, we were in the world we were at galleries or in art centres which were not very far from our – well my house – that the collaborators from out of town have always had a more intense, I think, experience of the residencies. In Bundanon we were all separated from our daily lives and our daily concerns. We couldn’t even pop to the shops really without really organising that mission. What happened was we went very, very deeply into the conversation we were having and we were also half way through our project so we knew each other very, very well already and we also weren’t feeling the pressure of having to come to a conclusion. We were in this very open middle phase where we just wanted to find out more and more and more about each other and have this conversation at a very intense pitch. So the experiments that we did and the experiences that we had were all very deeply felt, I think, and all had quite extraordinary impacts on us as a group, but also on us individually as practitioners. Mike Leggett: How would you as a curator describe the outcomes, for yourself and also for the public if there is to be a public, do you foresee a public? Lizzie Muller: Thinking Through The Body is not like anything else I’ve ever done before actually, even though I have been involved in – I’ve been involved in research projects often, I’ve been involved in residencies often and I’ve also been involved in collaborative projects often. Something about this is quite different and I’ve been thinking about what that is and I think it’s much, much more – it’s a once in a career opportunity, maybe career is even the wrong word maybe it’s more like the life span of your practice. That’s the thing I keep thinking about in terms of this project, that this has had a very big impact on the way my practice integrates with my life and the way my practice is going to evolve over the rest of my life, which sounds like a big claim but I think it’s quite true. This was more than professional development or career development it was very much about having a fundamental transformation in terms of the way I think about and understand my own practice. Trying to explain what that change is, is difficult but maybe not impossible. I’ll have a go. That change in my practice is to do with understanding the relationship between why I do what I do as a curator and my own experience of firstly the world and secondly art. Working in this way with these people has helped me to understand what it is that draws me to art, why I’m interested in art and my interest in art is to do with the way it transforms our ability to understand the world. It’s also transformed my understanding of why I work with technology. In this project we’ve had three things going on at the same time. One is technology, one is the body and one is art. Those are the three – and they’re huge topics. Of course you’ve got very particular approaches to those so our approach to the body has Feldenkrais. We’ve had these Feldenfrais practitioners with us and that Feldenkrais approach is very much to do with learning and having insights that are internal so you go through a structured process of learning that leads you to an insight about the way your body works. What we’ve done is discovered a relationship between that structure of learning and the structure of art. For me it’s been a discovery that art is also a process of learning about my relationship to the world and practising Feldenkrais at the same time as practising art has given me this incredible embodied – much, much more that physical, more to do with one’s whole self way of understanding that. I’m aware that that sounds huge. Mike Leggett: So this will inform how your curatorial practice in the future will address the public? Lizzie Muller: My curatorial practice has always been concerned with experience and people’s experience of art, so in some ways it’s a continuation of that and a deepening of that. I think the major change is in me understanding it better within myself. I’m absolutely sure that it will have an impact on the way I go about doing my work for the rest of my life or for as long as I practise. It’s much more about me having a clearer understanding about how I how that, why I do that and a much better way of communicating with other people about their experience of art as well. On of the things we’ve practised a lot here is the eight of us have talked to each other constantly about our own experience of art and of the world and we’ve developed that language to describe and articulate experience, which I think has been a profound gift. Mike Leggett: So, for you what is thinking through the body, now? Somaya Langley: For me it’s actually coming back to the body, because most of the work that I do is in front of a laptop, me thinking and so my brain’s out here, the laptop’s my entire interface to what I’m doing and I, you know, sit there for many long hours, but I [unclear], so this permission to be allowed to come back to the body and to include it in a process of getting work done is almost number one. Then, the whole time I think both Maggie and I have been trying to question, you know, what is art, what is – I mean, [unclear] make it sound art in the era and what is Feldenkrais and those two fields of practice have been quite different and solely trying to edge them closer to each other. I think it’s only – perhaps only yesterday here, that we started just kind of really bringing that together and it’s always a really slow process. So, I arrived back in Australia almost a year ago and so, sort of arriving and doing this residency within two or three weeks of arriving, the first one at Campbelltown and then in Bundalong, and this one now, it’s only at this – well, this is actually the fourth meet up, but it’s only in this time that I think we’re really almost starting. It’s, you know, a lot of talking and a little of thinking and experiencing things that it doesn’t feel like work. Mike Leggett: So, those two themes are a particular part of the Riversdale experience. Was there anything else that was particular about that experience, again for you? Somaya Langley: For me – definitely. I grew up in an environment very similar to Bundalong. I grew up on a property just outside of Canberra and a couple of kilometres from the Murrumbidgee, on a hill overlooking the Brindabellas, so I know that land and that landscape really well. For me – the whole time that I was trying to make creative work and I had three decades of relationship with this particular property, so for me trying to make creative work I never felt like I could out there because it felt so dissociated from what I was making, so with lots of sound recordings with trains and then, you know – and I would; I would sit out at a table outside with a laptop and headphones, looking out over the Brindabellas and not really experiencing how idyllic it was, because my work was all about cities and – but, somehow you learn things as you get older. After living in Berlin for just over a year and then suddenly coming back, doing that residency and six months later going to Bundalong and having that time in that environment that, I guess, was like a sense of home. Nowhere really feels like home but that, kind of knowing that climate and the dryness of the air and the way that the – you know, how the trees are around you, that sense of extreme familiarity for me. Then, bringing all that work in there, for the first time it worked so it’s that space that it provides, and on so many different levels. So, yeah, of course, you’re out in nature and you’re allowed to just be a part of it and not be constant – which is what happens here. Mike Leggett: Did you or the group make specific, like, focussed outings into that environment? Somaya Langley: Yeah, so there was a workshop that we did with Jonathan and Catherine called Situated Body and the first one – it was quite directed but it was very open at the same time. So, we actually went down to the Bundalong Homestead and were given, you know, this task of – go and find a place and then in some ways develop some kind of practice around being in that environment. So, I wandered off; everyone else sort of stayed close to the home shed, or to the homestead, and the shed’s around it and I wandered down the path to the river, of course, which is habit for me really. It really is. Mike Leggett: Why is it habit? Somaya Langley: Because I grew up in the Murrumbidgee – and it was, you know. I wandered down the track to the river. To then – but to re-approach that environment in a different way with an intent that I’ve never in that time have, so to just do a little walking exercise down the beach, back through the water and it was sort of all being about listening; and it is. You integrate in a way that – we went on a same walk here yesterday in Sydney, and I took a group of us around and it’s a very different experience. It’s still amazing to do a same walk and go from the carriage-works to Redfern Station down to Cleveland Street, but it’s a very different experience. It’s about pace as well. Mike Leggett: So, how would you describe the outcomes for you, for this whole project – and also would you foresee any outcomes for the public? Somaya Langley: Yeah, definitely, outcomes for the public, but I think those are the things that need a little bit more – or a lot more incubation time. So, really, this is about, while it’s been thinking through the body it’s also been about me thinking through my head and I’m someone who needs a lot of soak time, so it looks like it’s procrastinating – and it probably is procrastinating, but in the back of my head stuff is going around and then at some point, after almost it seeming like way too long and nothing’s going on, actually something comes out and it’s taking a long time to kind of learn to live with it and embrace it and let it do it that way. I don’t know what those public outcomes would be, but, definitely, I mean, a lot of my work over the last six or seven years has been about body and gesture, but more of the electro-acoustic side of things, strap sensors on your body and then as a musician and as a sound artist, start to do movement – and I’ve never been a dancer, so it’s all a bit awkward. There are, I think, themes that will come out of what’s going on here, but what was so beautiful about the process and it is – it’s totally a once in a lifetime experience. I don’t think we’ll – you know, we would never get funding to be able to have a research – not that I can foresee in the future. Maybe someone will do it again, but to have that opportunity for research which, you don’t really get on art projects, you’re always outcome, outcome, outcome, projects, performance, that are the next thing. I’ve done it once before. I’ve done a residency where it’s been about developing exercises, but not to this degree of crossing over of ideas and allowing it to develop naturally. I think, that’s – and probably that was very much Bundalong’s –I can hear someone playing back [unclear] recordings of random things over there and I don’t know if that’s from Bundalong, but being in that and being allowed to kind of let it envelop you, and eating – George is an amazing cook. George and Lizzie get this team thing going and, I mean, you know them – and they work so well together, they cook and they eat and I’m someone who will eat toast and hummus and it’s just, run back to the laptop again. So, it was kind of opening the doors and shutting down the laptop and being allowed to play. Mike Leggett: Fantastic. Great Somaya, that’s wonderful. Somaya Langley: That’s fine. Thank you. It is, seriously. It was amazing.